Using Graphs The GDP gap is the difference between the actual production at point and the potential production as indicated by points bl or HI What happens to production when some resources are idle or are not employed efficiently? One measure of the cost of stagnation is the GDP gap—the difference between the actual GDP and the potential GDP that could be produced if all resources were fully employed. In other words, the gap is a type of opportunity cost—a measure of output not produced because of unemployed resources. 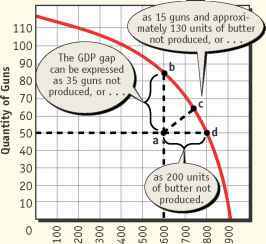 The GDP gap, illustrated in Figure 16.1, shows the production possibilities curve in the classic guns-versus-butter example. Note that the output not produced because of resources that lie idle can be measured in either guns, butter, or a combination of the two items. In a more dynamic sense, business cycles or fluctuations cause the size of this gap to vary over time. The scale of GDP is such that if GDP declines even a fraction of a percentage point, the amount of lost production and income can be enormous. 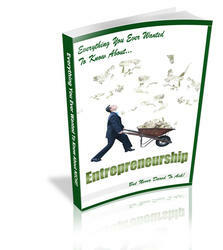 In 1999, for example, the GDP of the United States economy was approximately $9 trillion. If a $9 trillion economy declines just one-fourth of one percentage point, $22.5 billion of production would be lost. This amount is more than the federal government spent on agriculture or general science, space, and technology during the entire 1999 fiscal budget year. Described in other terms, this amount would be equal to 750,000 workers losing jobs that paid $30,000 each for an entire year. In practice, the effects of a decline in GDP generally are spread out over a large area rather than being concentrated in just one spot, but they are still enormous by any measure. The misery index, sometimes called the discomfort index, is the sum of the monthly inflation and unemployment rates. Figure 16.2 shows the misery index for a period beginning in 1965. Although it is not an official government statistic, the misery index is a comprehensive measure of consumer suffering during periods of high inflation and unemployment. The index is relevant only over long periods because of the wide month-to-month swings in some of the numbers. When the economy is unstable, a great deal of uncertainty exists. A worker may not buy something because of concern over his or her job. This uncertainty translates into purchases that are not made, causing some unemployment to rise and jobs to be lost. The worker is not the only one the uncertainty affects. For example, the owner of a business producing at capacity may decide against an expansion although new orders are arriving daily. 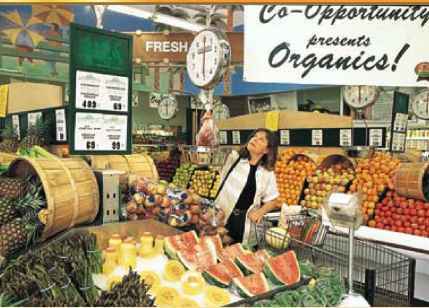 Instead, the producer may try to raise prices, which increases inflation. What makes the GDP gap a type of opportunity cost? What does a gdp gap indicate on a production possibilities graph? What makes the misery index relevant only over long periods?